Article 36, with Action on Armed Violence, Handicap International, Human Rights Watch, Norwegian People’s Aid, Oxfam, PAX, and the Women’s International League for Peace and Freedom (also members of the International Network on Explosive Weapons), made a submission to this inquiry focusing on the transfer of explosive weapons by the United Kingdom to Saudi Arabia, and subsequent use and resulting humanitarian harm in Yemen. The use of explosive weapons in populated areas causes a distinct pattern of harm. Each year, tens of thousands of civilians are killed and injured as a direct result of the use of explosive weapons in populated areas. If the effects of explosive weapons extend across a wide area because of the scale of blast, or because they are inaccurate or use multiple munitions, then this poses a particularly serious threat when used in populated areas. The International Network on Explosive Weapons (INEW), an international network of non-governmental organisations, calls on all states to stop using explosive weapons with wide area effects in populated areas. In 2015, Action on Armed Violence (AOAV) recorded more civilian deaths and injuries reported from explosive weapons in Yemen than in any other country around the world. 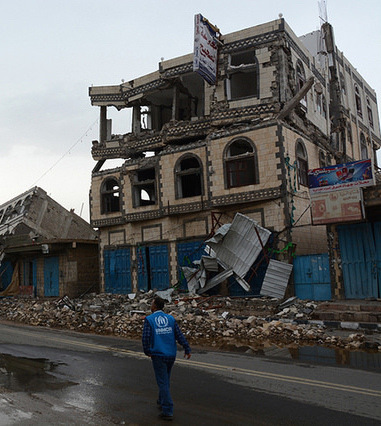 All parties to the conflict in Yemen have made widespread use of explosive weapons that have a wide area impact in populated areas, including aircraft bombs, rockets and mortars, as well as improvised explosive devices (IEDs). A report produced by AOAV and the UN Office for the Coordination of Humanitarian Affairs (OCHA) analysing violence in Yemen between 1 January and 31 July 2015 showed that explosive weapons killed and injured 4,493 civilians in that period. Aerial bombing by the Saudi-led coalition was responsible for 60 per cent of civilian deaths and injuries from explosive weapons in Yemen, according to that report. The report identified a total of 835 civilian deaths and 1,847 civilian injuries between the launch of the Saudi-led coalition’s military intervention in March and the end of July 2015. 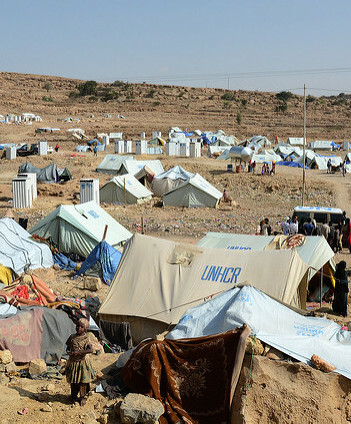 According to the UN High Commissioner for Human Rights ”the [Saudi Arabia-led] coalition is responsible for twice as many civilian casualties as all other others forces put together, virtually all as a result of airstrikes.” More than half of all the reported Saudi-led coalition air strikes in Yemen were recorded in populated areas. The report documents a widespread pattern of strikes hitting civilian residential areas, schools, mosques and markets, including within the capital Sana’a. The large destructive radius of many aircraft bombs means that even if a military target was struck within a populated area, civilians were still frequently among the casualties. When aerial bombing took place in populated areas, civilians made up 93 per cent of resulting deaths and injuries. Between 1 January and 31 July 2015, AOAV recorded 13 separate incidents in Yemen that each killed and injured more than 100 civilians. Eight of these incidents were air strikes, three were caused by ground launched explosive weapons like rockets and mortars, and two by improvised explosive devices (IEDs). These attacks included the bombing of the port city of Mokha on 24 July, where six bombs fell on a residential compound in what was described by on-the-ground investigators as an apparent war crime. In recent airstrikes on crowded market places in Sana’a and Hajja governorates in February and March, at least 145 civilians were killed, including 33 children. The UN High Commissioner for Human Rights condemned the attacks and noted that the distinction between legitimate military targets and civilian ones by coalition forces is at best woefully inadequate and that these incidents may constitute international crimes. The use of explosive weapons in Yemen has had a devastating impact on children. According to the UN, nearly three quarters (73%) of child deaths and injuries during the second quarter of 2015 were caused by air strikes by the Saudi-led coalition, and 18% of child deaths and 17% of child injuries were attributed to Houthi forces. Human Rights Watch (HRW) has documented the use of cluster munitions by the Saudi Arabia-led coalition in Yemen, believed to be supplied by the United States. Cluster munitions are a type of explosive weapon and are prohibited under the 2008 Convention on Cluster Munitions (CCM) because they present considerable and unacceptable risks to the civilian population both at the time of use, and after the conflict ends. According to UK Government reports, between 1 April and 31 September 2015, the UK authorised more than £1 billion worth of bombs and missiles for use by the Saudi Air force. Through the transfer of arms to the government of Saudi Arabia, including explosive weapons, the UK has a responsibility to prevent the civilian harm inflicted on the civilian population in Yemen, as documented above. As a party to the Convention on Cluster Munitions, the UK has an obligation under the CCM to discourage any use of cluster munitions, and encourage Saudi Arabia to accede to the Convention on Cluster Munitions. Given the devastating impact of the use of explosive weapons in populated areas, we urge the UK Government to endorse the UN Secretary-General’s call for all actors to refrain from using explosive weapons with wide-area effects in populated areas and to work together with States to develop an international commitment to this end. Supplies of arms, including explosive weapons, to combatant parties in Yemen should cease immediately where they are at risk of being used in violation of international law. The UK government should review its existing arms export policy so as to include consideration of a country’s use of explosive weapons in populated areas as a risk factor for the refusal of future arms licenses. The UK should discourage and condemn any use of cluster munitions, and encourage Saudi Arabia to accede to the Convention on Cluster Munitions.